The mother of all German Christmas markets, Cologne’s Christmas market is considered to be one of the largest in the world. There are several different markets dotted throughout the city and each market has a different flavour and atmosphere. 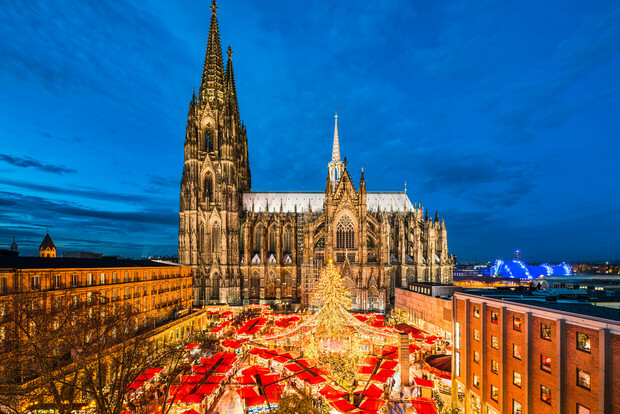 The largest one sits in the shadows of Cologne Cathedral and boasts over 160 stalls selling everything festive – from different flavours of glühwein to personalised Christmas snow globes. 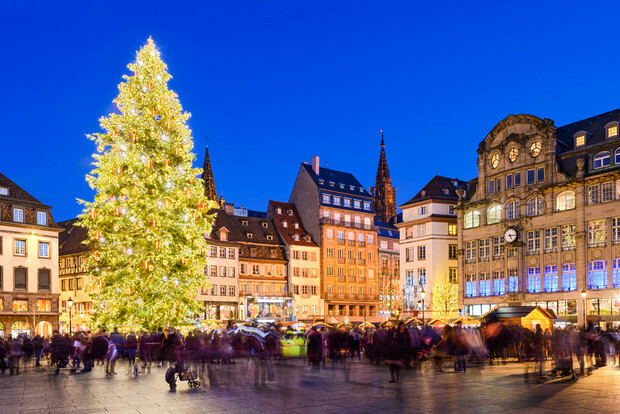 Strasbourg is Christmas central, quite literally. It’s the largest and oldest Christmas market in France and has been dubbed as the Christmas Capital of the world. Here you can buy one-of-a-kind gifts made from wood and glass, and you can eat your way around Strasbourg’s medieval streets, gorging on Christmas cakes and gingerbread. It’s everywhere and it’s delicious. Don’t forget to warm up with a mug of steamy vin chaud- Strasbourg’s answer to mulled wine. Strasbourg’s location near the German and Swiss border means you can visit one of the other famous markets in the area, such as the ones in Stuttgart and Basel. This is what winter wonderland dreams are made of. Salzburg literally looks like it was specially created and designed for the sole purpose of Christmas. 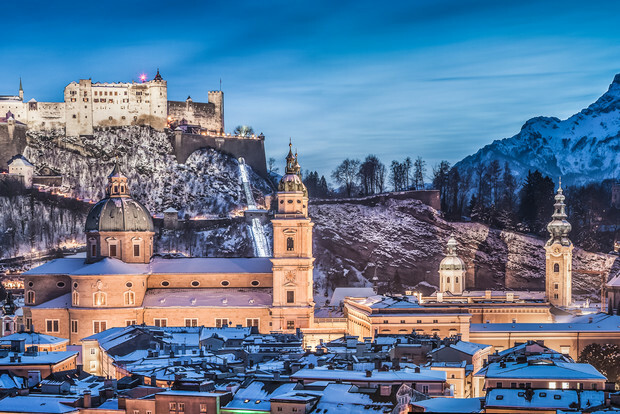 Sitting below an imposing Baroque cathedral, looked over by a medieval hilltop castle and squeezed in between a medieval fortress, Salzburg’s old-world charm makes it an atmospheric venue for a charming Christmas market. While there are lots of markets around town, we think the best is in the heart of the old town. 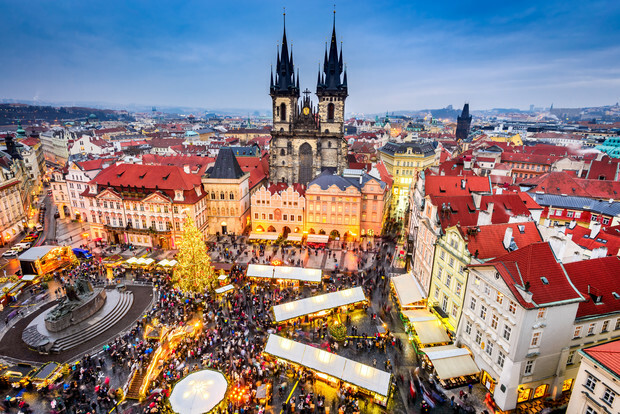 Rows of colourfully decorated huts organised around a giant Christmas tree sell a mix of hand-crafted wooden toys (including classic Czech puppets), handmade jewellery, candles and crystals. Be sure to try the medovina, a honey wine known as mead in English. Home to not one but two famous Christmas markets. 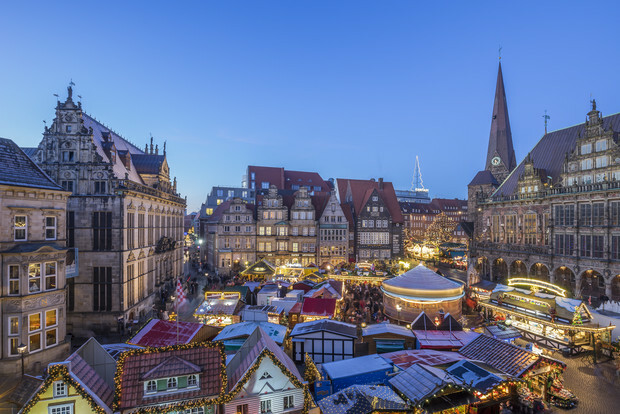 Bremen’s old Christmas market has over 170 food and craft stalls and is considered to be one of the most beautiful Christmas markets in Germany. But Bremen is also home to the Schlachte Magic on the Weser river embankment. Not your typical Christmas market, it is nonetheless a very magical one – the whole waterfront turns back the clocks to become a medieval fair full of food, music, and shows which hark back to the jugglers and street entertainers of the Middle Ages. No, this isn’t the town from Disney’s Beauty and the Beast. This is a real place, it’s Estonia’s capital Tallinn. Having one of the prettiest and most picturesque Christmas markets in Europe, Tallinn’s medieval old town transforms itself into a true Christmas wonderland. 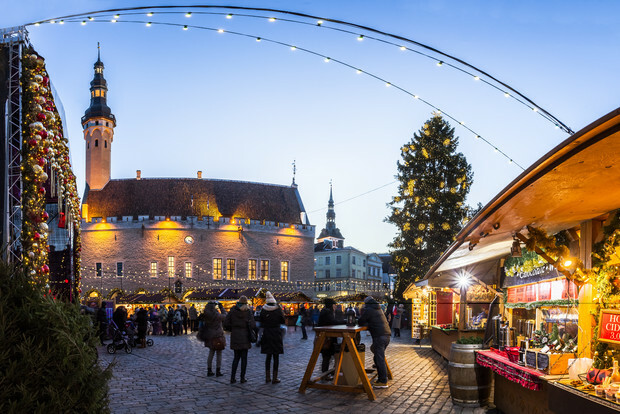 Tallinn is also home to Europe’s first public Christmas tree and if you get tired of the shopping and drinking mulled wine, you can enjoy some outdoor ice skating in the heart of its old town. 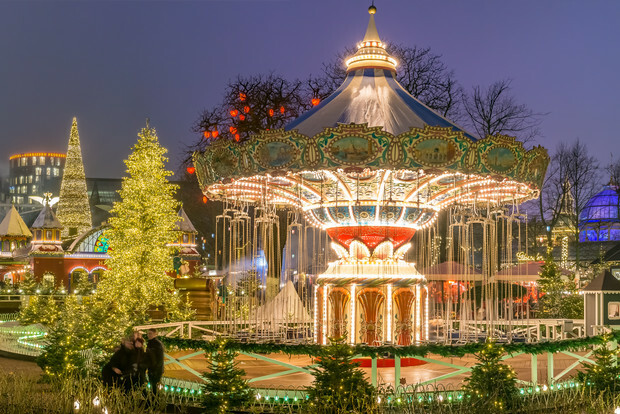 Tivoli Gardens, Europe’s oldest amusement park, becomes adorned with thousands of lights and packed with hundreds of trees to host the city’s Christmas market. Frozen over, the park’s main lake is also turned into an ice-skating rink. The food and drink here is as much a draw as the atmosphere and arts and crafts on offer – particularly the glögg (spiced mulled wine) and hot apple dumplings. 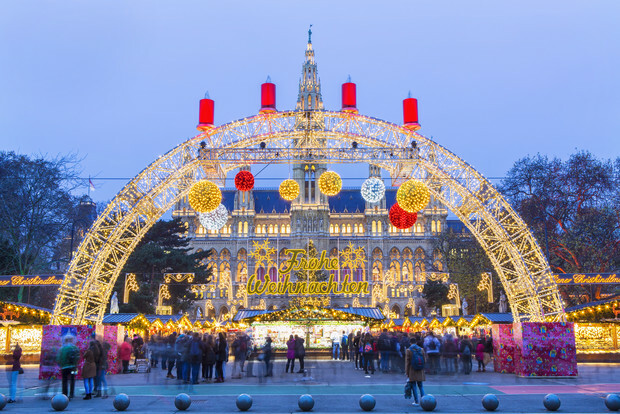 The Christkindlmarkt on Rathausplatz starts earlier than most, in mid-November, and is one of the biggest Christmas markets in Europe. 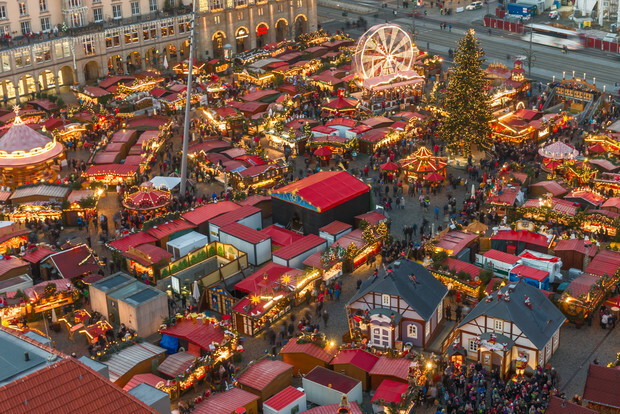 Almost 200 stalls dominate the square, selling traditional decorations and hand-crafted gifts as well as scrumptious, melt-in-the-mouth Viennese pastries and Weihnachtspunsch (a spiced punch). Christmas in Edinburgh sees Scotland’s capital wake from a post-summer Fringe Festival slumber with a series of events across the city centre. 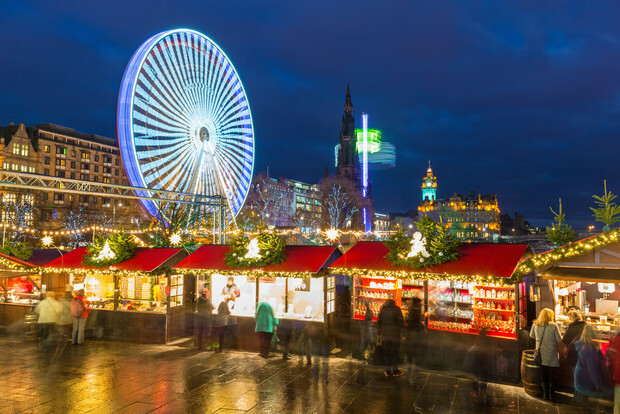 Along with a calendar of shows and performances, as well as an epic lights and music display (The Street of Light), the arrival of its Christmas Market on Princes Street marks the beginning of the city’s festive season, which culminates in the world-famous Hogmanay Street Party. Wander around the market’s food stalls, pop-up bars and craft stands and be sure to take a ride on the Ferris wheel for epic views of Edinburgh Castle and the old town. Striezelmarkt is one of the oldest markets in the world; the first mention of it cropped up in the 15th century. Artisans from all over Germany gather to sell some of the best crafts Germany has to offer. Regional specialities include the famous blue-and-white ceramics, crafts from the Ore Mountains, blown glass from Lauscha and much more.
? ? ? ?? ✈️ ? ?